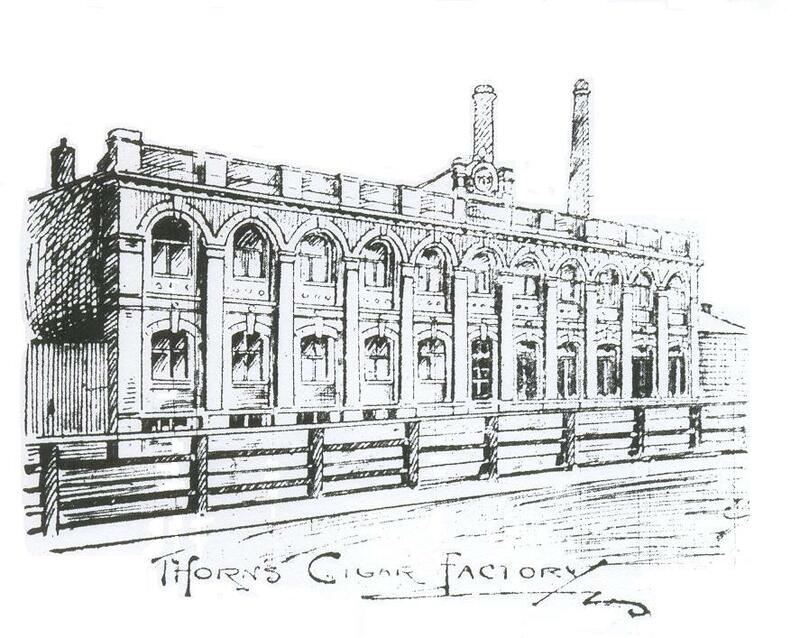 The cigar factory of Thorns, Son and Co. (above of which is an 1897 illustration) was an imposing looking building on the drainside near Bargate Bridge. As you entered at the back on one side was a bond warehouse and on the other side trunks of timber, these were cedar and were used in the lower storey of the building for the making of cigar boxes. In a room 80 feet by 70 the trunks were split and sub-divided again and again, planed and spoke-shaved by machinery until they were thinned and sized ready for making the neat boxes which carried Thorns cigars. In the next room women lined and labelled the boxes. Nearby was a storeroom where bales of various kinds and qualities of leaf lay bound in small bundles waiting to be fetched upstairs for manufacture. There were all kinds of tobaccos from all parts of the world. First it was shaken out of the bundles by young people and watered so as to become pliable for working, then it went into the stripping department where each leaf was spread out and the central fibre torn away. Next it was passed onto the cigar makers who were roughly 150 girls and women seated in a large room 112 feet by 60. Each worker received a certain weight of tobacco from which to make a hundred cigars and the weight of material for each cigar was judged entirely by touch. When finished they were put in the boxes, placed in the drying room and after due seasoning stacked in the sale room ready for consignment to various places.